The insured losses from natural and man-made disasters worldwide in 2017 were $144 billion – the highest ever recorded in a single year. This is according to Swiss Re which said, “At USD 144 billion, the insured losses from natural and man-made disasters worldwide in 2017 were the highest ever recorded in a single year. 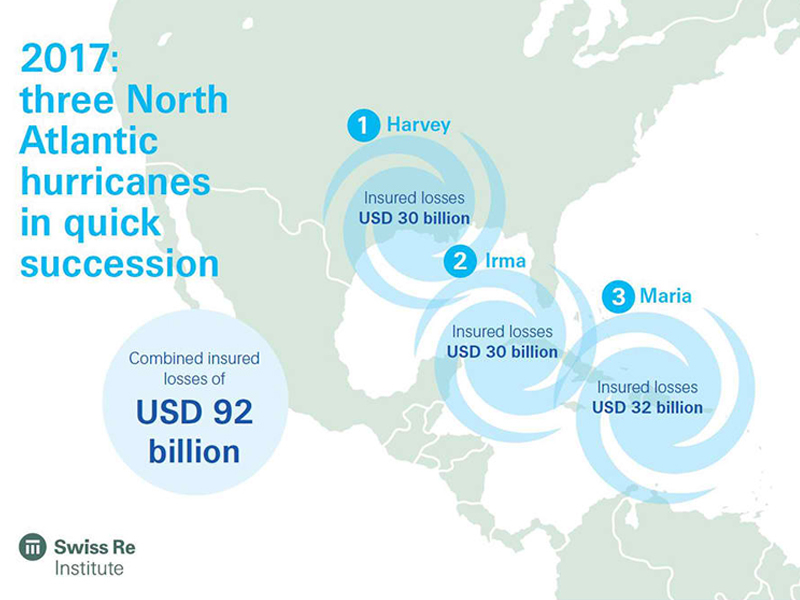 “The main driver of the high insured losses was an active hurricane season in the North Atlantic. In particular, three major hurricanes – Harvey, Irma and Maria [HIM], which all reached category 4+ intensity,1 – left a trail of destruction across the Caribbean Islands, Puerto Rico, Texas and parts of western Florida. “HIM struck multiple locations in quick succession and impacted many lines of business. The storms resulted in combined economic losses of USD 217 billion, and insured losses of USD 92 billion. From a risk management perspective, the HIM experience highlights that hurricane frequency is as crucial a factor to measure as severity of a single storm in modelling loss scenarios. “So too are secondary risk factors like the excessive rainfall that can come with hurricanes: Harvey is a case in point, with its very heavy rains leading to widespread and destructive flooding in Houston. “Economic losses from all disaster events – both natural and man-made catastrophes – were USD 337 billion last year. “Natural catastrophe-related economic losses made up of the bulk of these losses, at around USD 330 billion in 2017, coming mostly from hurricanes, severe storms, wildfires, floods and other weather events in North America, the Caribbean and Europe. Man-made disasters are estimated to have caused the remaining USD 7 billion of the economic losses, down from USD 10 billion in 2016. “The total insured losses covered more than two fifths of the economic losses from last year’s disaster events, pointing to a global catastrophe protection gap of around USD 193 billion, significantly more than USD 124 billion in 2016. Insured claims were up from USD 56 billion in 2016, and above the inflation-adjusted annual average of the previous 10-years [USD 58 billion]. “Overall, natural catastrophes globally resulted in claims of close to USD 138 billion, much higher than the previous 10-year annual average [USD 50 billion]. Insured losses from man-made disasters were around USD 6 billion, down from USD 8 billion in 2016. “In other major disasters, wildfires ravaged parts of California in particular, as well as regions outside of the US. Insured losses from wildfires worldwide last year were the highest ever recorded, totaling USD 14 billion. “Projected changes in climate, including warmer temperatures and prolonged periods of drought, are expected to continue to increase the frequency and severity of large fire events. There were also a number of severe precipitation events in 2017, in different regions. These highlighted the vulnerability of an increasingly urbanised world to flood events. “Houston, which suffered major flooding on account of the severe precipitation that came with Hurricane Harvey, is a primary example, as is the flooding of the Yangtze River in China due to heavy rains.